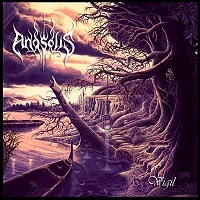 ANDSOLIS are a German band that know how to make some weird and wonderful music. The band describe themselves as "Progressive Melodic Death Metal", a term that doesn't quite fully encapsulate their entire sound fully. Their music has elements from across the musical spectrum in it, and it is so much better and far more interesting for it. Since forming in 2012, this is their first release, so not only is this the bands first album, but their first overall release. "Stand Vigil", the song which kicks this album off, is an incredibly powerful and Technical piece of music, spanning almost ten minutes. It can quite easily fall under the Extreme Metal umbrella, but it is also accessible and catchy in a way that makes me thinks that this will have a wider appeal than your average Death Metal record. Of course, there are a lot of the key elements of Death Metal are in there, but one crucial one is missing, at least for some of the track; the standard Death Metal vocals. Manuel and Oliver opt for more powerful vocals at many points in this album, and they actually work very well at many points. Likewise, Kingdoms Without Shape" is another really good Progressive Death Metal track with really cool vocals, changing from growls and grunts to clean vocals throughout the track. "In Silent Confidence" is another track that shows that this band is able to work around musical conventions and create their own sound and style, namely through the use of clean and distorted guitar tones at various points in the song. The next song, "The Mystic" is easily the heaviest track on here, and is more or less a Thrash tune with a Progressive edge to it. And then we come to "Days of Receding Light", a song on which the band ups the ante in terms of the Progressive influences in their music. There's plenty of interesting riffs and time changes, and some well placed keyboard sections which really enhance the rest of the song. The penultimate track, "Meridian Smiles", is another song which heads down a much heavier route, with lots of Groove and Technical riffs, although the Progressive elements are still definitely there. The last track, "The Laughter Echoes", is a very mellow piece of music which acts as a really great way to close this album. It's rare to come across a "Progressive" band that actually produces an album which takes their chosen genre to entirely new musical pastures. This band have managed to do that effectively, without completely abandoning the Death Metal elements in their sound. There's a lot of great musicianship on offer on this record, and I'd thoroughly recommend it to anyone who wants to check out Death Metal with a difference.